Cherries are a delicious summer treat, sweet and fun to eat. But in addition to being a great example of a natural, delicious food packed with nutritional benefits. Interestingly, many conventional websites are quick to point out that cherries have a lot of sugar and little nutritional content—but they are missing several worthwhile perks of these little red fruits. Here are 5 health benefits of cherries. 2. Cancer-fighting - Cherries are loaded with a type of antioxidants known as anthocyanins, which can actually stop cancer in its tracks. According to dietician Karen Ansel at EatingWell.com, “… preliminary studies suggest the anthocyanin cyanidin may prevent genetic mutations that can lead to cancer and keep cancer cells from growing out of control.” Sweet cherries are better over tart for anti-cancer benefits.
. Gout prevention and treatment - Gout is a painful disorder characterized by an overabundance of uric acid in the body. Cherries lower uric acid and C-reactive protein levels. According to one study, just 45 sweet cherries can provide relief. 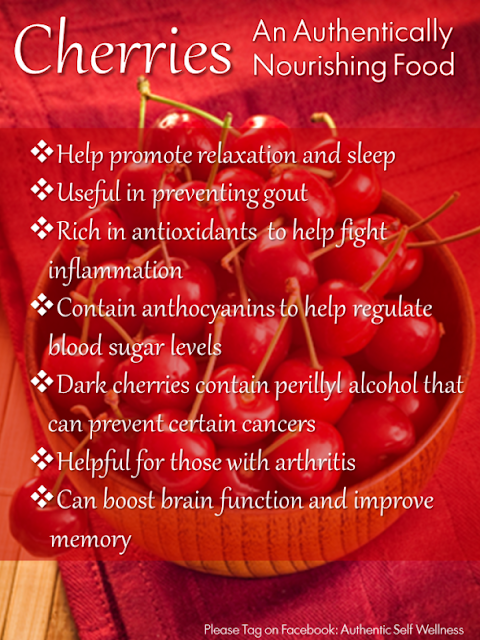 Cherries may be one of the best home remedies for gout. 4. Improved sleep - Melatonin, the hormone that regulates our sleep and wake cycles, is difficult to find in natural food sources. But, cherries is one of the few places where it is abundant. Tart cherry juice in particular has been proven to increase melatonin levels that could improve your quality of sleep. 5. Blood pressure management - Adding on to the health benefits of cherries, the tiny red delight may also be among many solutions for high blood pressure, partly due to containing high levels of potassium. They also contain quercetin, important in maintaining vascular health. Cherries are both tasty and beneficial to your health. To experience the greatest health benefits of cherries, try to purchase them in-season and organic whenever possible.